I’m obliged to begin with this metric. Customer churn is the first logical question you would ask when looking at the health of your customer base. However, customer churn hides a lot of factors, especially how much those customers that churned were actually worth and if you sold anything else into the rest of your customers to offset that loss. Looking at revenue churn is more helpful as it factors in how much the churned customers are actually worth. If you look at it from a net revenue perspective you also factor in any expansion MRR from upgrades etc. This is basically the opposite of churn. Why look at churn this way? It’s a little bit more positive and also helpful when you start to get into the negative churn realm. Negative churn is meant to be a good thing but can sometimes sound less intuitive than +100% retention. Annualized retention rate gives you an idea of what % of revenue you expect to retain 1 year out from today based on today’s numbers. This is a tricky but interesting one. In most businesses it’s often not possible for all of your customers to leave at any point. Many of them could be tied into longer-term contracts or very early on in their lifecycle. By looking only at the customers who had a possibility to churn you will get a more realistic indicator of churn. The problem is it can be a lot of work to find out who falls into that bucket so use with caution! A lot of companies, particularly in SaaS have defined cancellation notice periods. Within that time it can be possible to turn the customer around by working with them to get value from the tool, discounting or negotiating contract terms. Of course in some instances a save is impossible but measuring the trend is a great indicator of the productivity of your customer success managers. This one is a little more vague than the others and that’s intentional. Product adoption is very specific to your business, product and customers. The problem with these numbers is they can seem arbitrary – how do you decide on them? 1) If you are a starting out and don’t have too much historical data you will have to rely on a mix of gut feel, talking to your users and implementing usage tracking. Ask questions like - what mix of tools does a user need to use to be successful, how long does that take? What apps are critical to your workflow? 2) If you have data to go on you can start to get more sophisticated. For example -looking at your customers who stick around – what common traits do they posses in terms of usage? This might not require a full regression analysis but working backwards from high retention to uncover common trends will help you define the product adoption numbers that matter to you. If your product is more transactional and depends on a high volume of users this metric will be a key indicator of customers success. Although it’s not without it’s controversy, active user numbers help separate high level metrics like total signups from customers who are actually getting value from your product. What did your customer hire your product to do? How long did it take them to do that? Are they seeing a return on investment? All of these questions help you determine what your actual time to value number should be. The classic example here is Facebook’s 10 friends in 7 days metric that their growth and engineering teams aligned around. It’s often referred to as the “aha moment”. In the SaaS world this number could more concrete and related to ROI. For example a certain number of closed won deals to see a return from your CRM tool. I haven’t had too much experience with this one but it’s interesting. The “magic number” helps determine what impact customer success is having on customer revenue. If you invest more in customer success does the revenue and renewal rate of your customer base scale with it? The key point to pay attention to here is the ratio of customer success cost to customer revenue and what direction it’s trending in. This is an often overlooked but interesting metric particularly as your company scales. Customer support, especially over the phone, is very expensive. Take this scenario – you have 10 customers and on average they have one ticket per day. That’s not too much to worry about early on but if those 10 customers suddenly become 100 and 1000 and your incident rate scales with them then so do call volumes, support team growth and IT costs. Incident rate isn’t only a great number to keep an eye on from a cost perspective but if you can segment it out it can also inform product direction and help align teams around customer problems. I’ve talked about team activity being a useful customer success metric in a previous post. This will vary depending on different product price points but the principle remains the same – if you don’t engage with your customers one-to-one they are not going to be as loyal. Team activity levels are a great leading indicator of harder to move metrics like churn and renewal rates. This metric really helps you look ahead for potential trouble months in advance. Take this scenario - in October you are planning ahead to make sure you get off to a great start next year in January. It might be useful took look at all your customers and see what percentage are actually renewing that month. However it could turn out that only 15% of customers fall into that bucket while in March 30% could be renewing. While not strictly a metric, it wouldn’t feel right to not mention the importance of cohorts. Cohorts allow you to analyze how a particular metrics change for certain group of customers. Below is a cohort chart I use on my team to monitor how product adoption is improving for newer customers that come onboard in later months. Across the top is the customers age in months and on the left is the month they signed up. These kinds of charts are really powerful for ensuring churn or any other customer metrics are moving in the right direction. 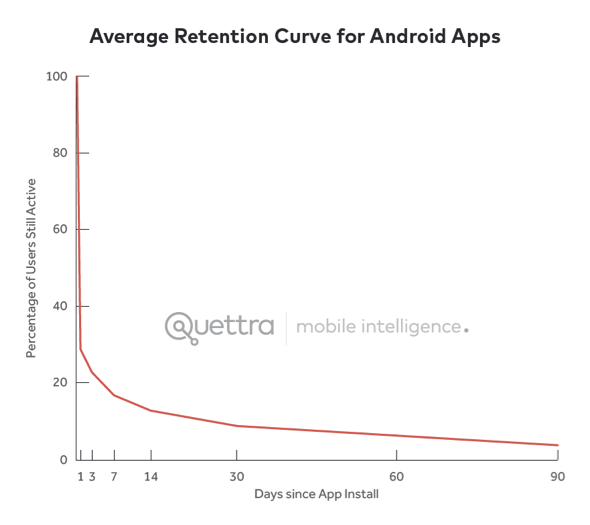 The x-axis shows the days since app install and the y-axis shows the % of users who are still active at that time. The general theory is that your retention curve should flatten out at some point if you want to have a valuable product. Otherwise all of your users will churn out at some point and this is not sustainable. This principle can be expanded to a few different concepts in the customer success world. Intuitively the time scales will have to be expanded but you could look at overall retention this way - what % of a particular cohort is still retained after 6 months, 1 year, 2 years etc. Is this improving for newer cohorts? Well…that ended up being a little bit longer than expected. Hopefully you find a few new metrics that will be useful for your team. The list never ends so this may be updated in the future with other metrics as I find them and get feedback. On that note, what other customer success metrics do you use?